South Africans face many challenges, from a tough economic climate to lack of employment opportunities, with hunger being a harsh reality for millions. This is why organisations such as Môrester Child and Youth Care Centre play a vital role in helping FoodForward SA address the problem of hunger in our communities. Môrester Child and Youth Care Centre in Rustenburg was established in 2008 after its founder, Helen Lotz saw a need for a place of safety for unwanted children. She committed herself to making a difference by finding loving homes for orphaned children, ensuring that these children receive the love and care they need to grow into their potential. 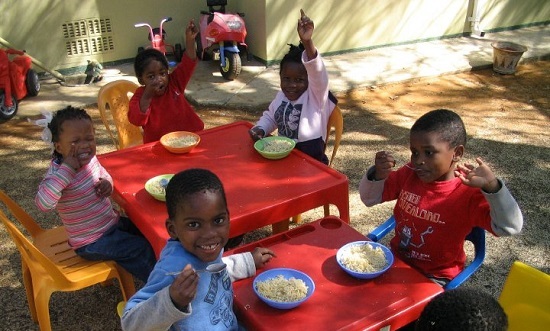 The registered non-profit organisation believes in a holistic approach to healing and provides its 61 children with physical and emotional support, gives them love and affection, and thanks to FoodForward SA, provides them with regular wholesome meals to help them develop physically and mentally. They are also taken care of by doctors and therapists who share the staff’s passion for raising these children in the best possible way. “One of our proudest moments was when twin baby girls deserted by their mother were adopted by a childless couple. When the babies arrived at the centre, they needed to be hospitalised. The couple heard about these beautiful little girls and visited them regularly until their bond became so strong that they just had to welcome them into their home. Today the girls are healthy and thriving and its success stories like these that keep us motivated”, said Helen.